"This helped me a lot with my resume, which needed a lot more work than I realized. I like quantifying my achievements. I never thought of that. My wife says she would hire me. Does that count? Actually, my new resume looks like a totally different person who is qualified for the positions I'm going for instead of being under-qualified. Thanks." The resume is one of the most widely abused and misunderstood parts of the job seeker’s toolbox. If you think it’s just a job history, you’re behind the times. If you think it needs to be “jazzed up” with graphics or a brand-new approach, you’re just way off base—and your resume is on its way to the trash. If you want your resume to grab attention and get you the interview, you’ve got to turn it into a marketing tool that sells you as the solution they need for their problems. You don’t have to turn it into a hype-filled commercial, and you don’t have to pay a resume writer to end up with a good one. 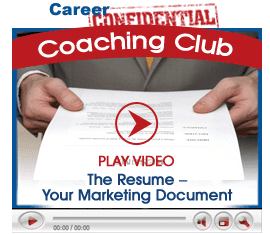 With the right training and guidance, you can learn to write a killer resume that represents you strongly and sells you as a candidate—in less than an hour.